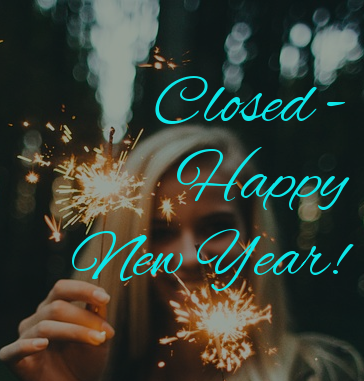 Here's to a fabulous 2019! Can't you feel the warmth of the fire in the chilly air? 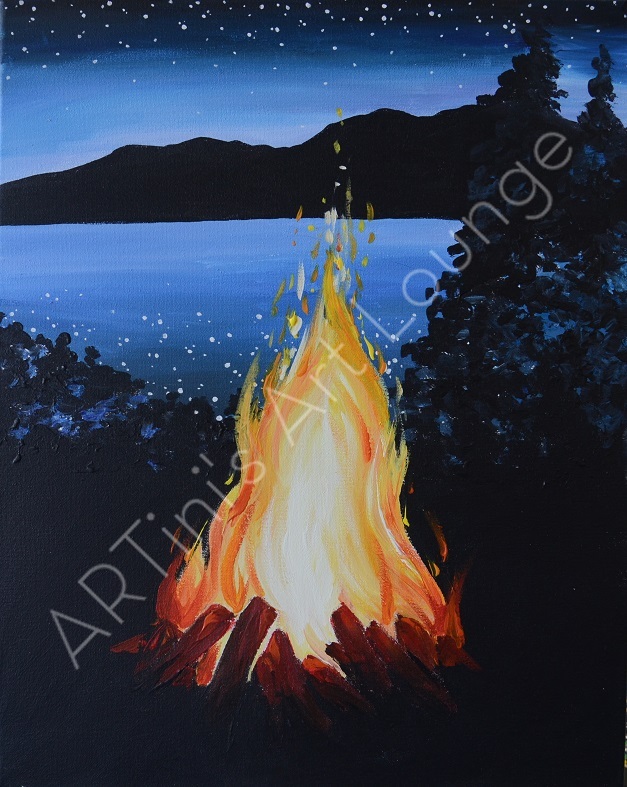 The warm colors of the fire stand out so beautifully on the dark blue & black background. Paint it up however you like. 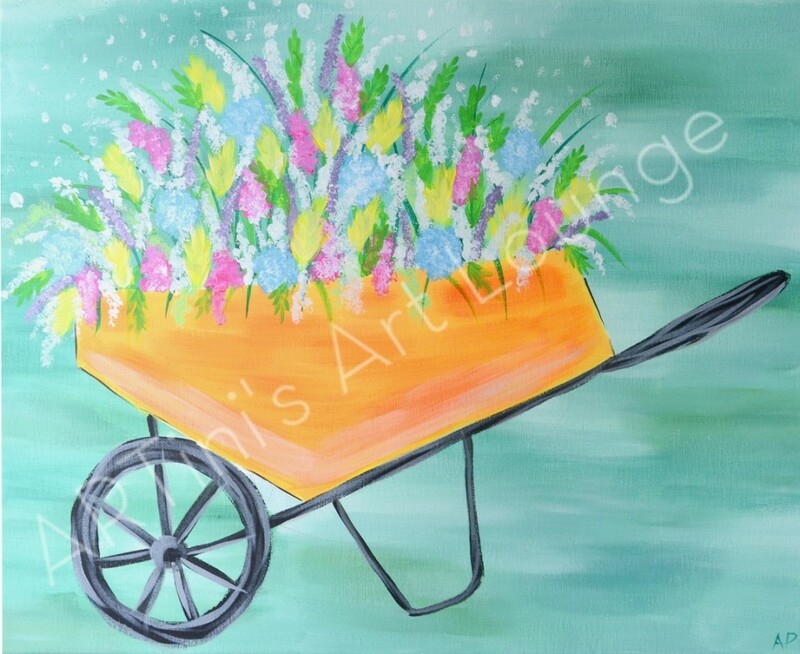 You can't go wrong with a wheelbarrow full of colorful flowers! 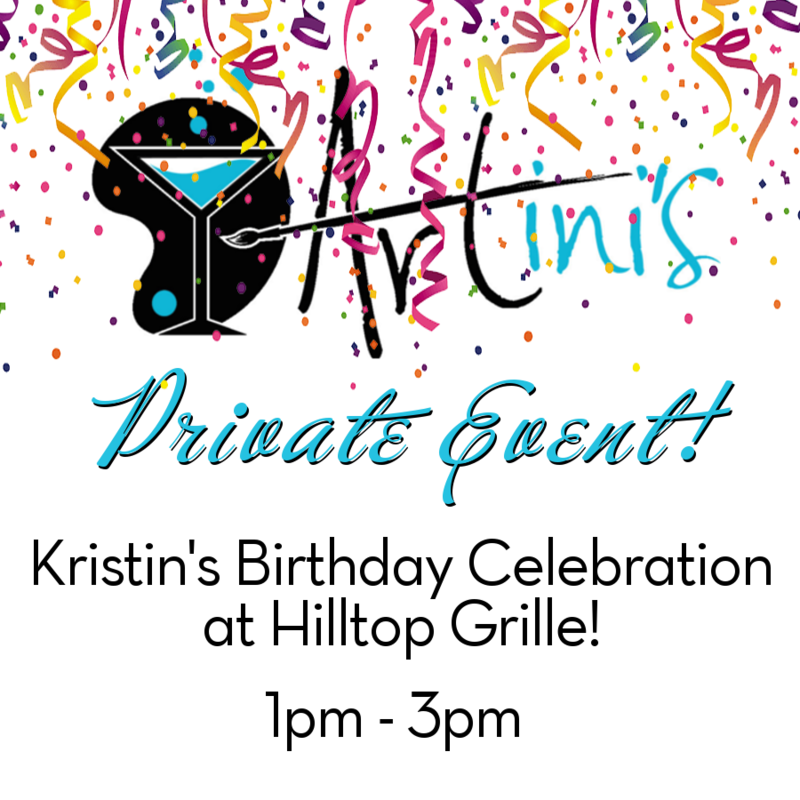 Kristin's Birthday Celebration at Hilltop Grille! Happiest of Birthdays to You, Kristin! 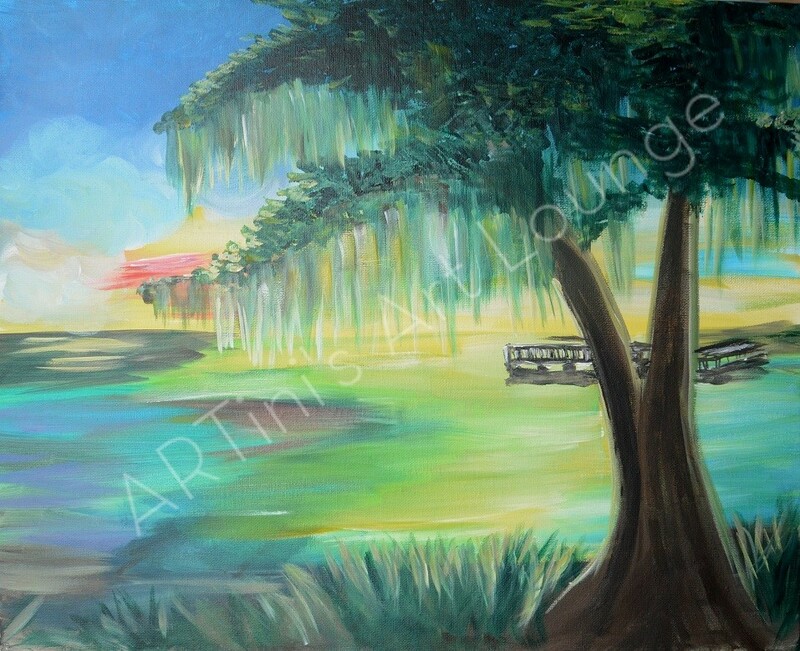 *Yes, we do off-site events! 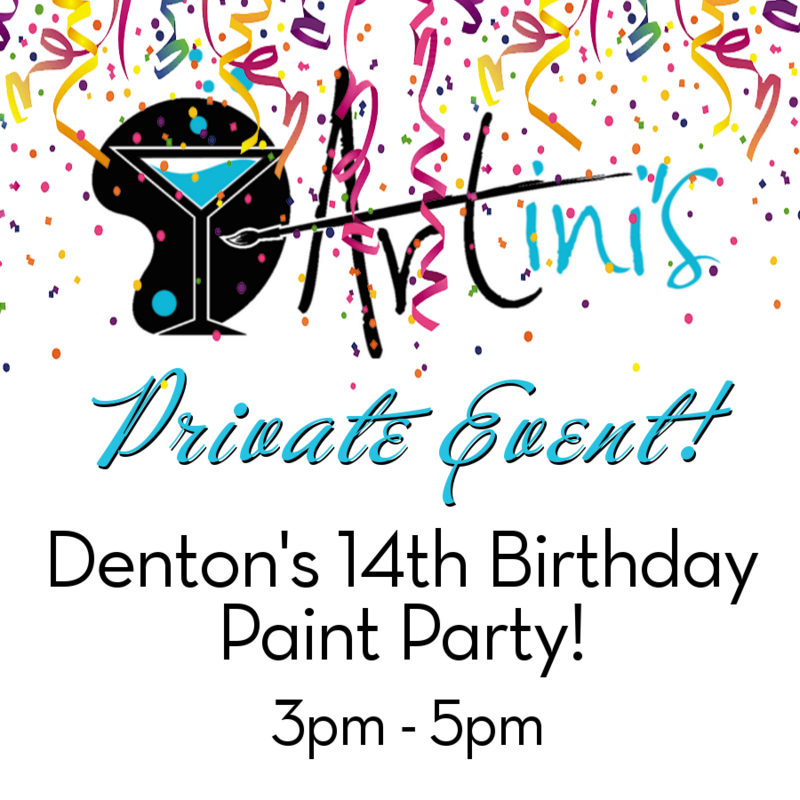 Contact us to learn about hosting a paint party in another location. Golden glow on banks & moss covered trees of the bayou. 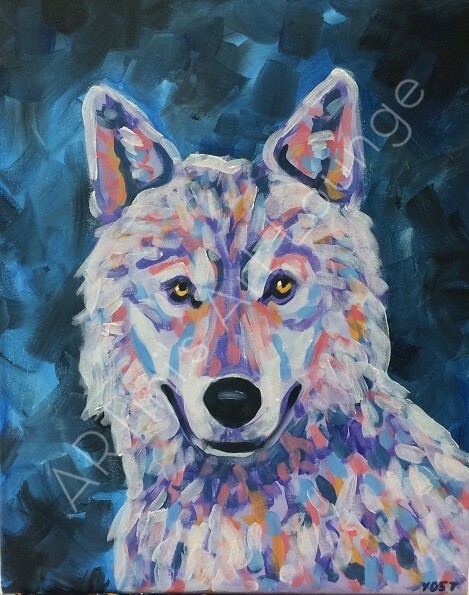 Start off 2019 with our White Wolf - a symbol of wisdom and balance in our lives. Basic shape is stenciled for you and the rest is fun with colors! 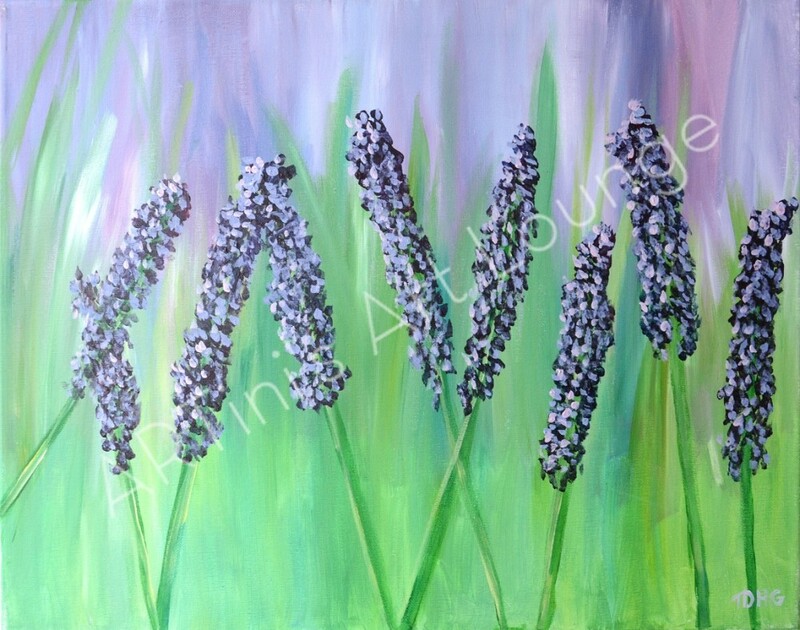 These gorgeous lavender blooms are simple to do! Lettering is on your own, folks! A little stenciling will be done for you for placement. 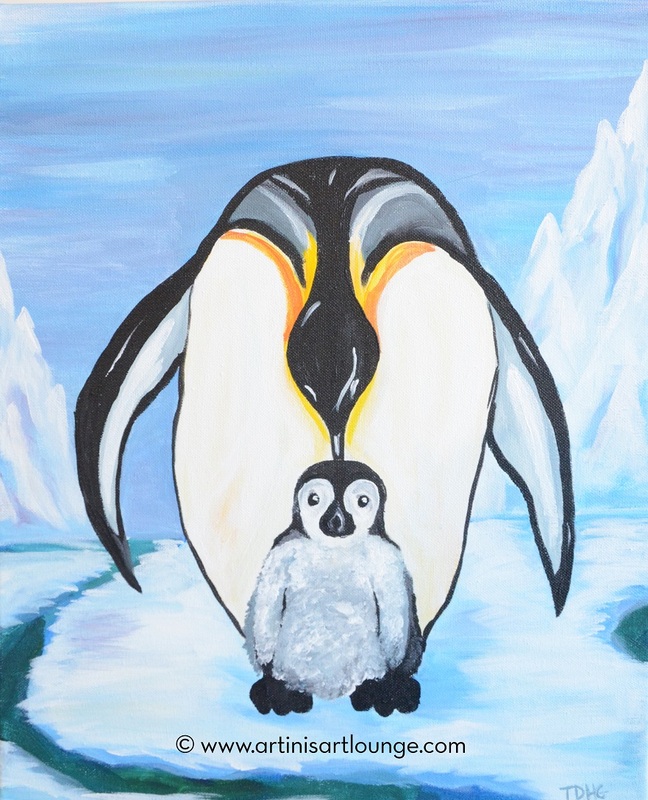 Adorable painting of a papa & baby penguin. 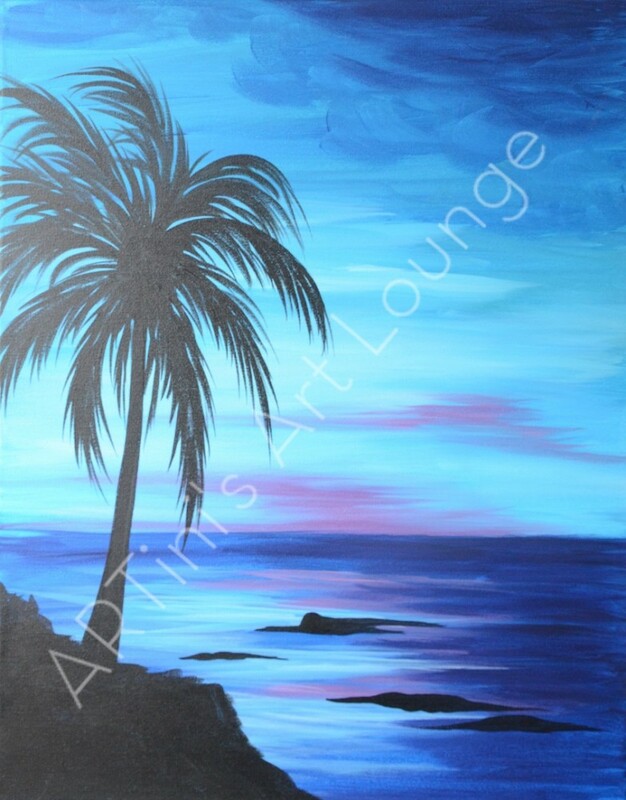 Simple & gorgeous beach scene. 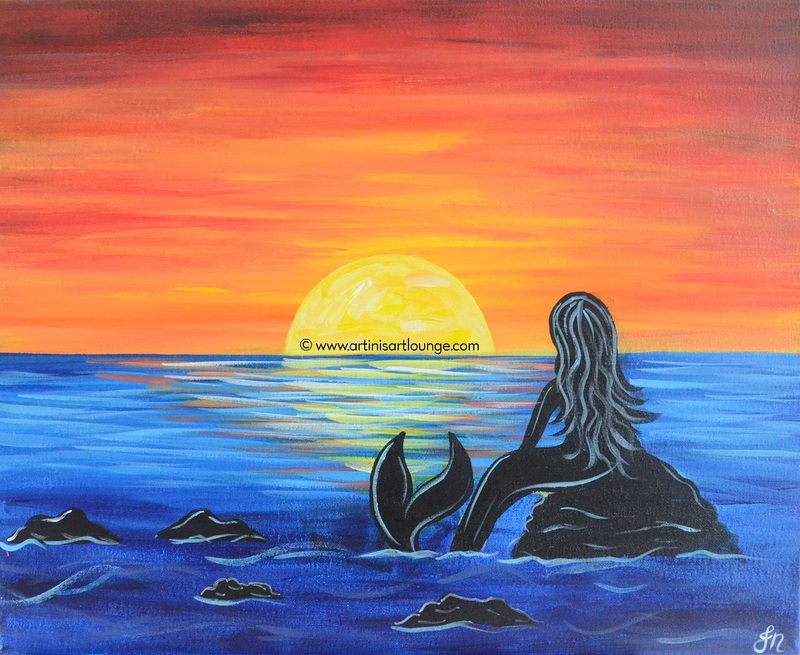 Beautiful warm sunset over cool water...what's that watching over there? We'll stencil on the mermaid after the background is completed. Fun with perspective & chunky paint. 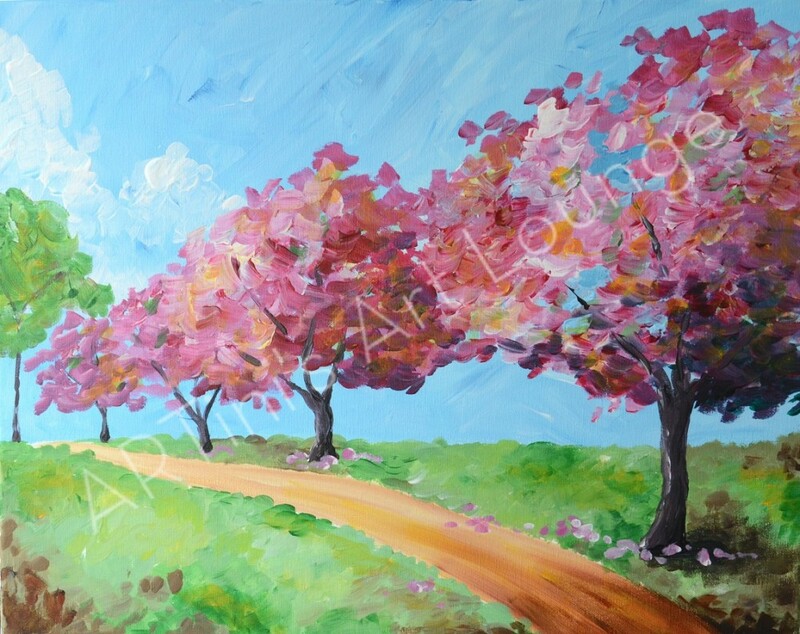 The colors & depth of this one make it lots of fun to do. 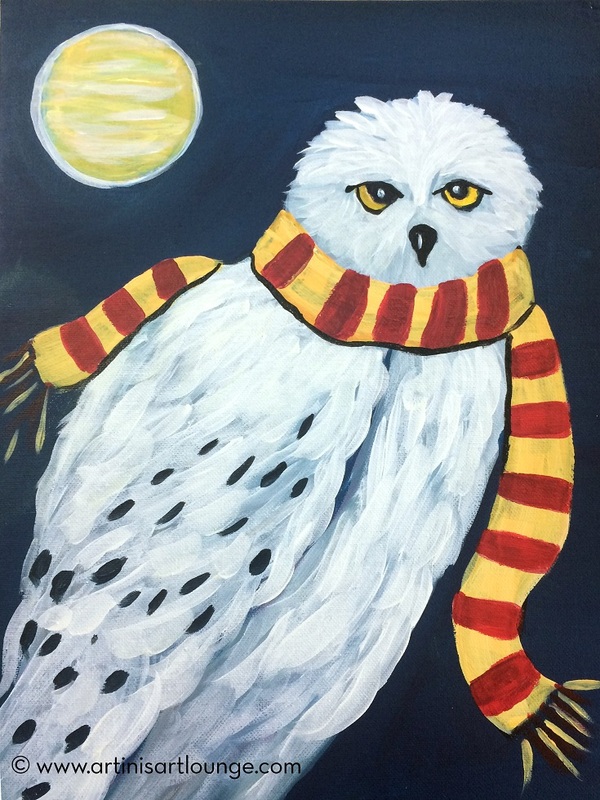 Harry Potter Paint & Trivia Night - Hedwig! He may not necessarily be part of the barnyard crew, but OMG this fella is ADORABLE! Basic shape is stenciled for you & the rest is fun with streaky color. 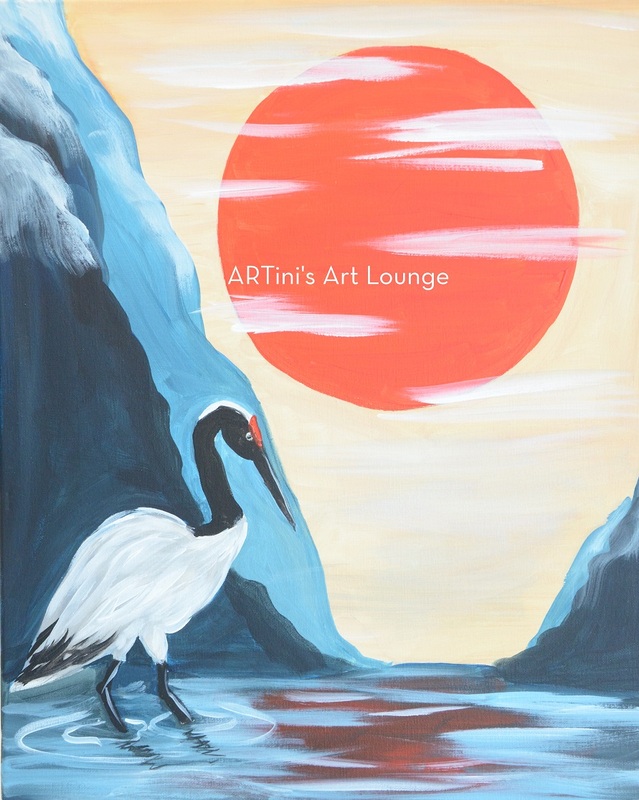 ***We're going to postpone this fundraiser to a future date. Thanks for being friends & supporters of Bear Hollow & stay tuned for the reschedule! Love Bear Hollow Zoo? We do too! 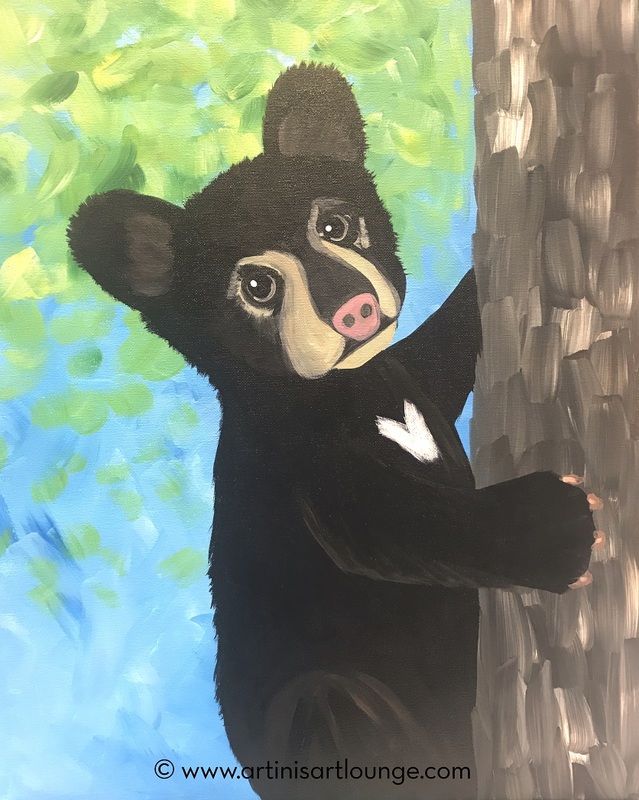 And you can show just how much you love our local zoo by joining us for this class to paint an adorable portrait of Bear Hollow's beloved American Black Bear, Athena. And if we can manage it, we may have a resident Bear Hollow Zoo at the event! 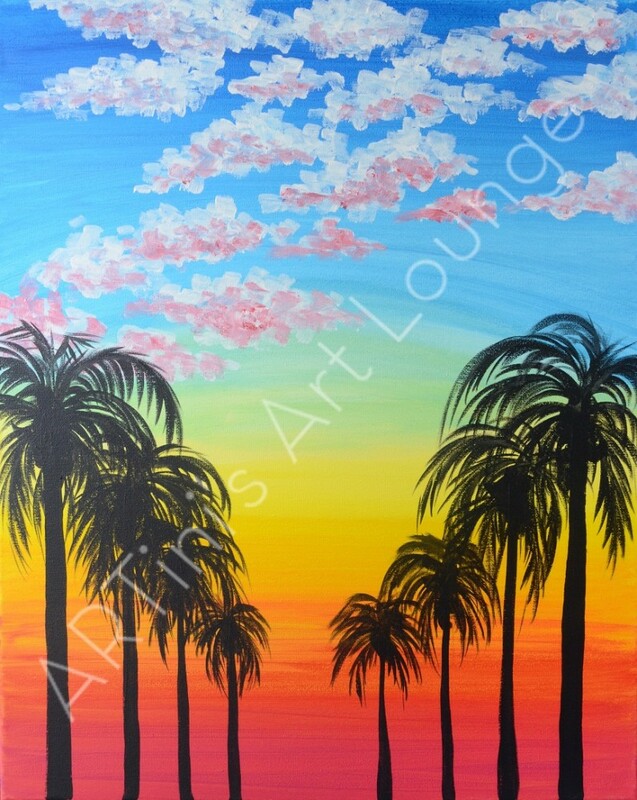 Another beautiful African Sunset you can add to your collection. We will have a stencil for the figure. Vase shape will be stenciled. This one is a lot of fun with design! 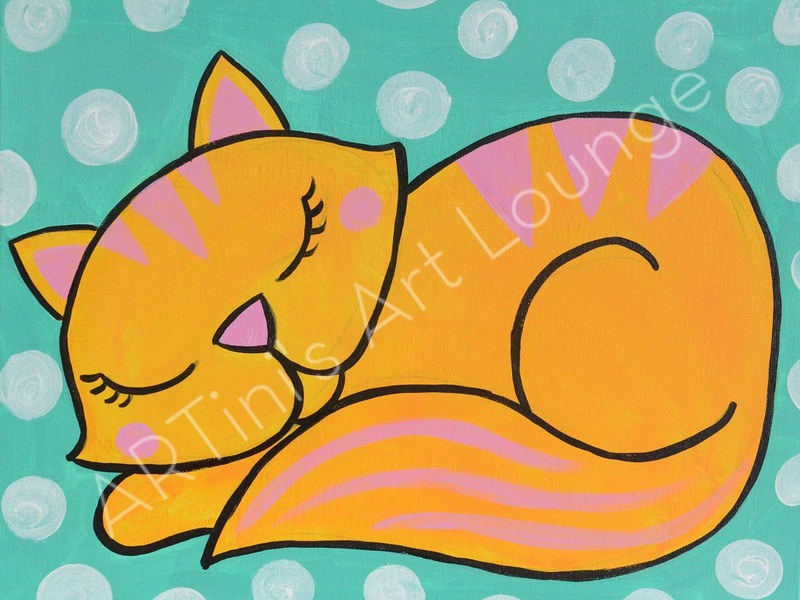 Paint the whole canvas black, then lay in your design. 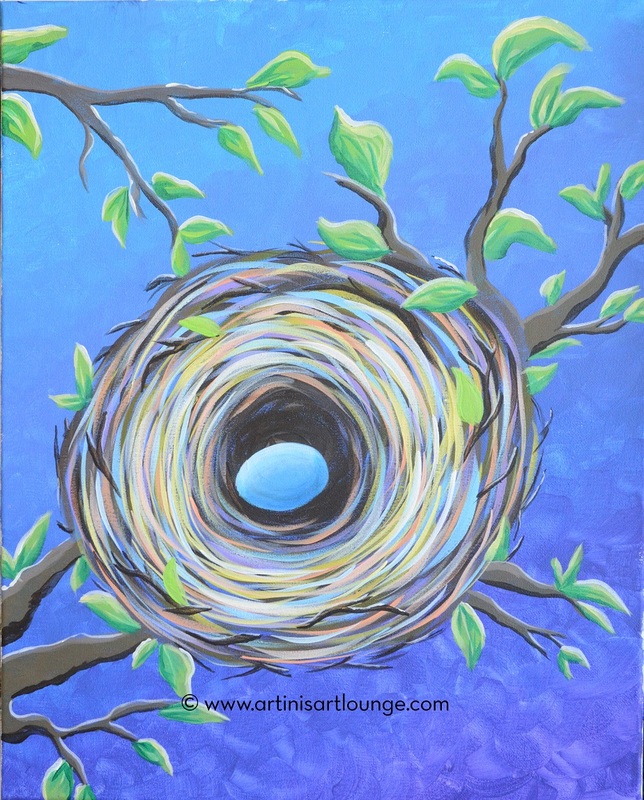 A bird nest is a symbol of the home. It reminds us that we strive to make our home a place where family members grow and prosper. Considered a good luck symbol, the bird nest represents all the love and warmth, enthusiasm and commitment required in creating the happiest of homes. 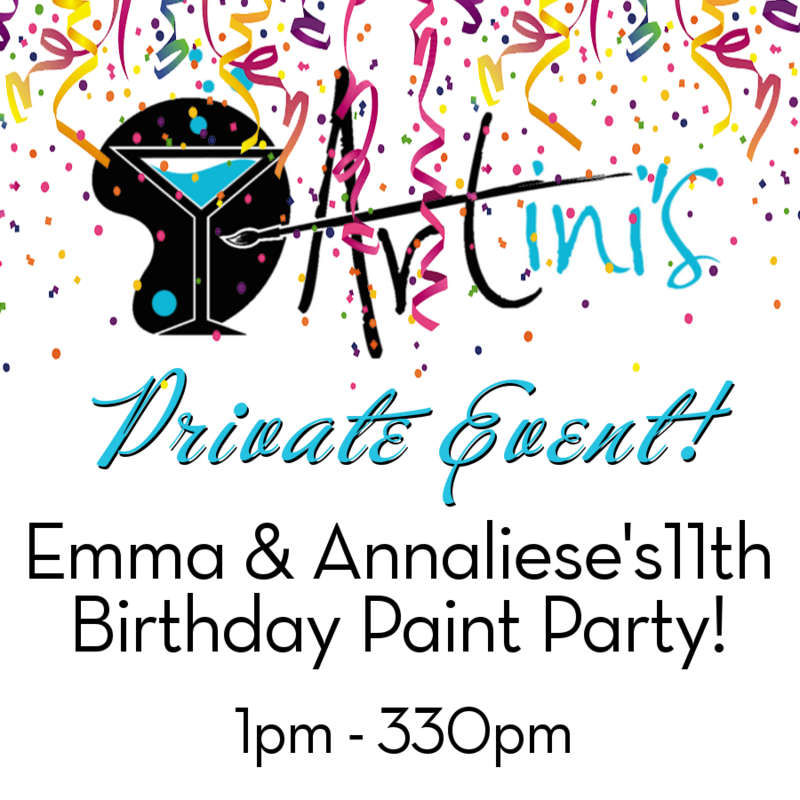 Happy 11th Birthday Emma & Annaliese!! 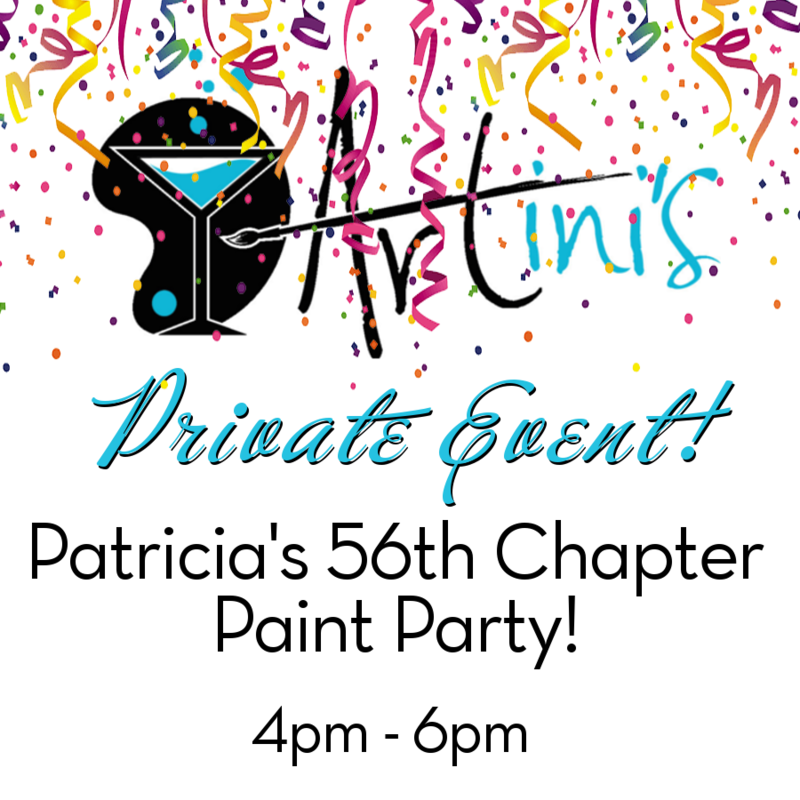 Patricia's 56th Chapter Paint Party! Happiest of Birthdays to YOU, Patricia! 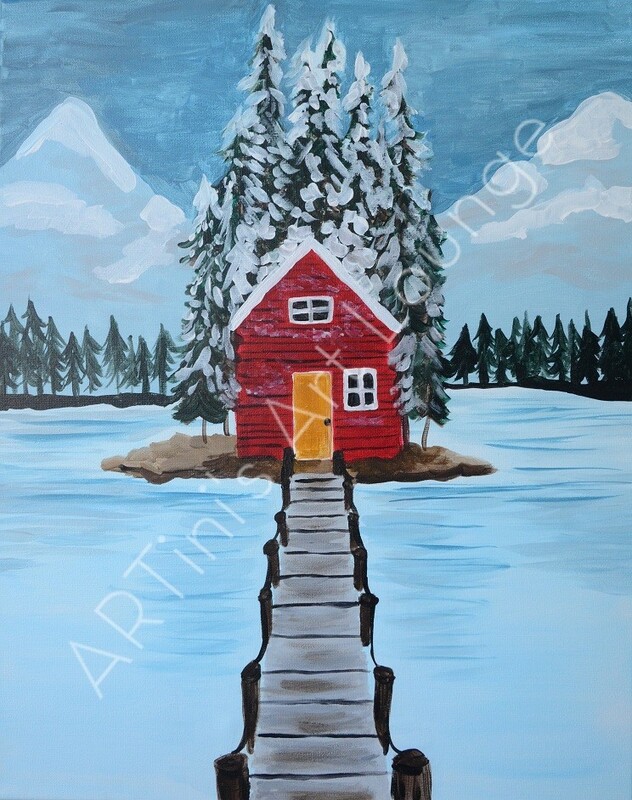 We'll have a stencil for the cabin shape & we will walk you through the rest! 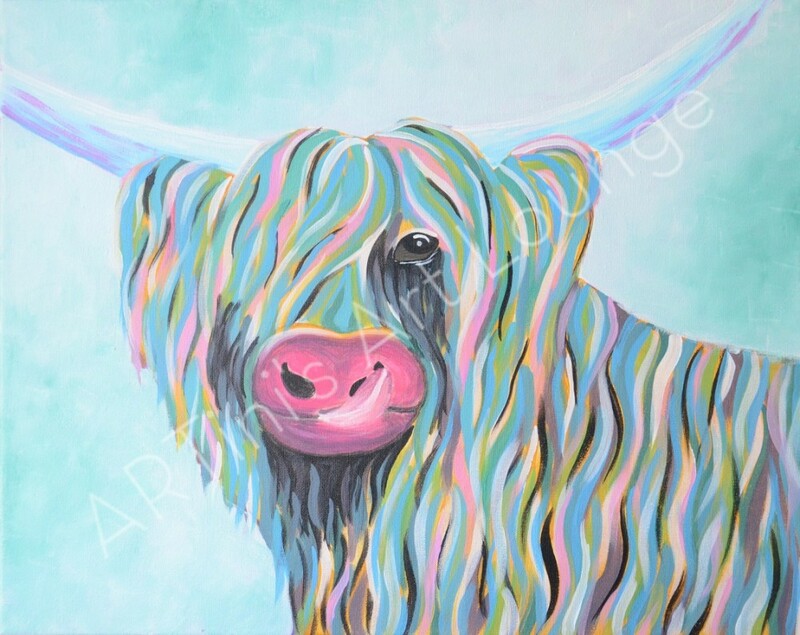 A rather popular piece! 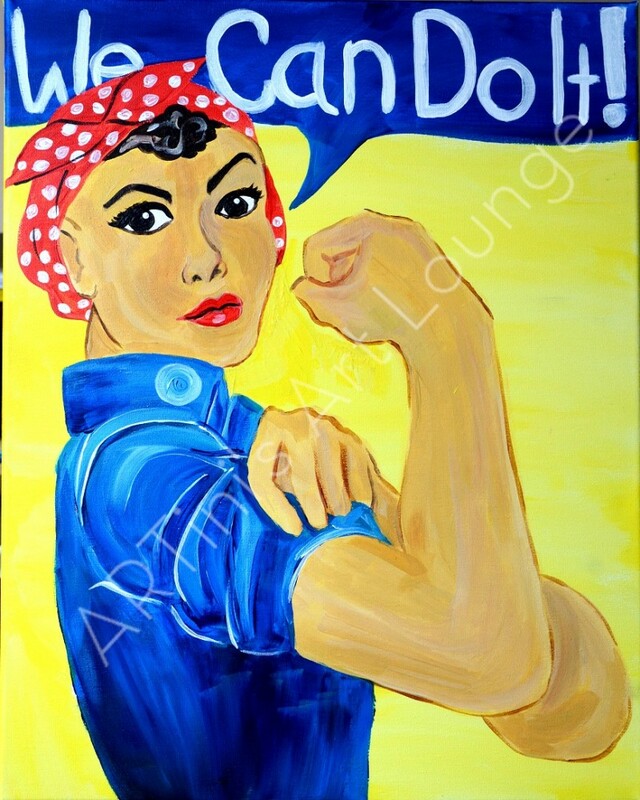 And yes, quite simple to do! 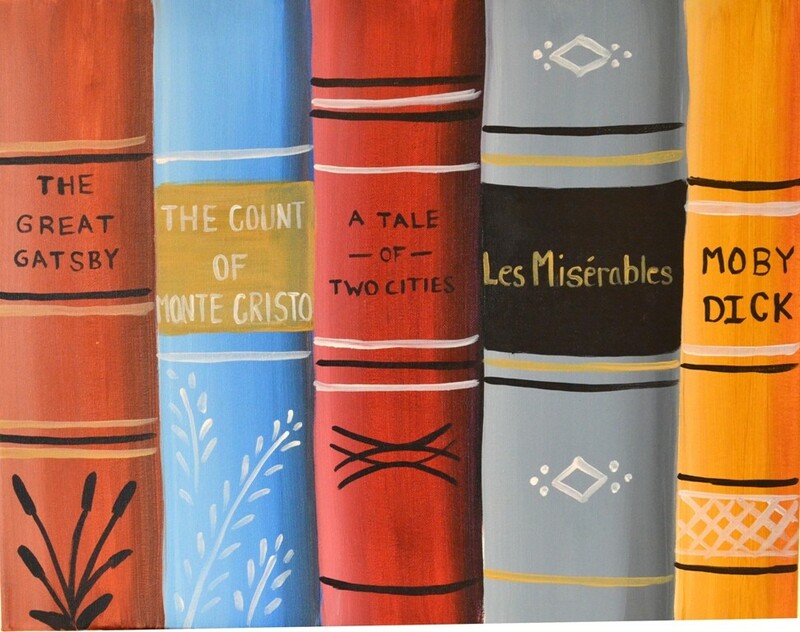 Choose your own titles, of course! Love the cool sky and reflection. And of course, the boat! It could be anywhere really! 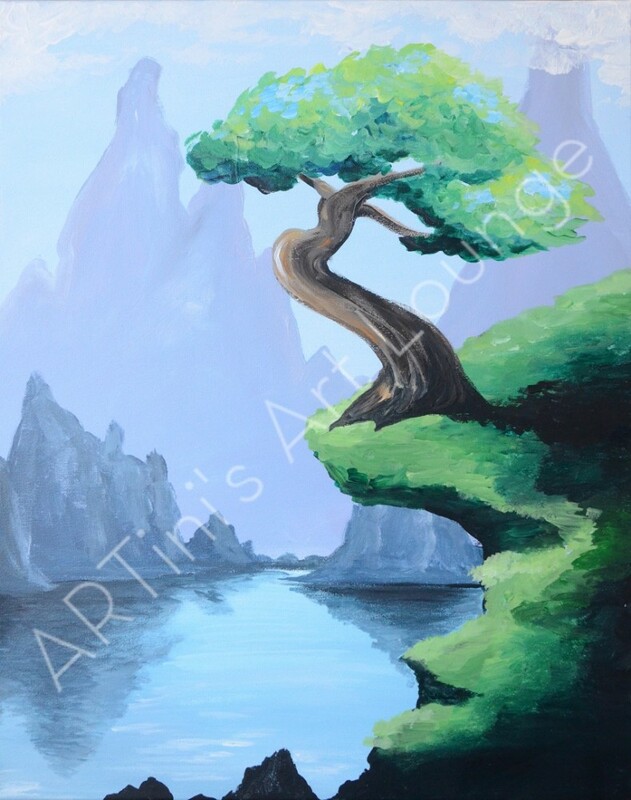 Beautiful light blue hues with darker rolling clouds create a depth you can feel.